The year 1954 was a landmark in the history of agricultural economics in India as in that year the Ministry of Food and Agriculture, Government of India, established 4 Agro- Economic Research Centres at Delhi, Pune, Chennai and Santiniketan. 2 more centres were established in 1958, one at Jorhat (Assam) and another at Sehore (Madhya Pradesh). In 1961 one more Agro Economic Research Centre was established at VallabhVidyaNagar.In the later years three more centres were established at Allahabad, Waltair and Shimla bringing the total number of centres in the country to 10. In 1966 two more centres were established at Ludhiana and Bhagalpur. 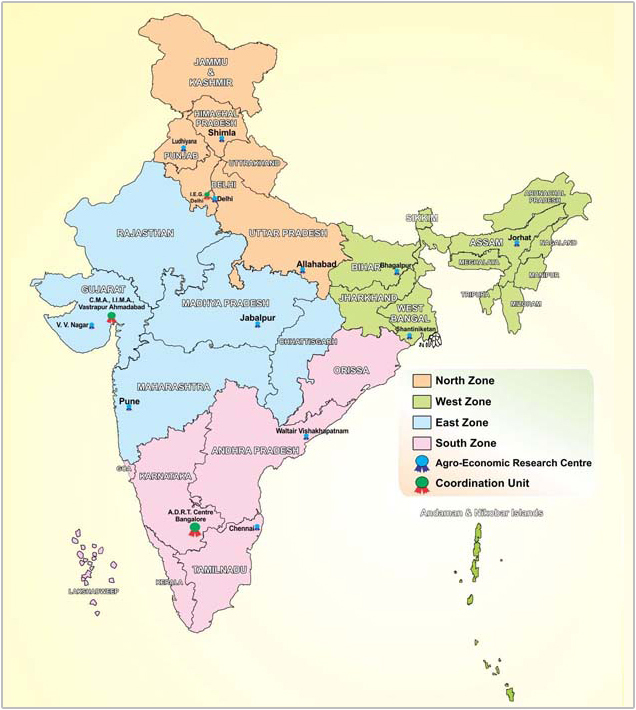 Thus, at present there are 12 AER Centres functioning in the country in coordination of three ministries i.e. IEG New Delhi, IIM Ahmadabad and ADRT, Bangalore. The Agro Economic Research Centres are autonomous bodies. These function as separate departments under the administrative and functional control of the university / institute where these are located. These centres are totally financed by Government of India through grant-in-aid. Agro Economic Research Centre for central India (M.P. and Rajasthan) was established at Sehore on 22nd December, 1958. In May, 1960 it was shifted from Sehore to Gwalior. The jurisdiction of Gwalior centre was confined to Madhya Pradesh. With the establishment of J. N. Krishi Vishwa Vidyalaya the administrative control of the Centre was transferred to J.N.K.V.V. from 1st April, 1965.